This Exhibit was part of the 31-Count indictment that Spencer C. Young filed with law enforcement against Paragon Commercial Bank and Poyner & Spruill and concurrently shared with North Carolina Leadership as well as appropriate Federal authorities. This exposes the basis upon which Paragon commenced its dastardly actions in carrying out the last phase in the Worst Bank Foreclosure Fraud in US History. Paragon abruptly rejected deposits to Mr. Young's Corporate bank accounts directly from his tenants who had had long been remitting their monthly rent in this manner, in order to give the false impression that there were insufficient funds to cover the monthly debt service on his loans -- And despite this insidious act by Paragon, this was NEVER the case. Paragon this unprecedented and patently absurd act on entirely convoluted logic. They cited a credit risk associated with how the funds were being electronically transmitted, namely the Automated Clearing House, explained below, and a protection against fraud for CONSUMER under a Federal Regulation, which is diagrammed below, which allows CONSUMERs who pay in this manner up to 60 days to contest payments they were defrauded into making. The problem with this is that: (1) no tenant paid rent from a CONSUMER banking account; (2) no tenant had ever claimed to have been defrauded; and: (3) there was NO ASSOCIATED CREDIT RISK WHATSOEVER. In other words, the rationale behind Paragon's insidious action was entirely concocted as part of their audacious bank foreclosure fraud. For those so inclined, this is explained further below, including an explanation of the Automated Clearing House. Mr. Young had long established arrangements with his commercial tenants to remit their monthly rent electronically via pre-established ACH arrangements with their respective banks such that they agreed to remit their monthly rent pursuant to pre-arranged debits from their commercial operating bank accounts for credit to Mr. Young’s designated operating account at Paragon Commercial Bank. What is important to keep in mind is that NONE of the tenants paid their rent from consumer bank accounts; rather rent was remitted from corporate business accounts. This is especially relevant because Paragon’s cited “exposure” from “numerous reversals” over the prior two months as the reason for abruptly canceling the ACH arrangements that were in place for many years (hence blocking the deposit of rental receipts). The truth is: (1) there were NO reversals associated with the subject property over the prior two months as contended by Jim Hoose of Paragon; (2) there is NO exposure whatsoever if the ACH is coming from a corporate account at the RECEIVING bank (i.e., the bank that receives the instructions to DEBIT their customer’s account) TO a corporate account at the ORIGINATING bank (i.e., the bank that originates the instructions) such that the designated account at the ORIGINATING bank is CREDITED for the transferred funds; (3) Paragon actually increased its credit exposure by blocking the deposit of rent remittances; and therefore (4) Paragon’s action was merely a smokescreen for their Machiavellian scheme to orchestrate an entirely FRAUDULENT default on commercial mortgage loans that had an exemplary credit payment history since their inception, dating back to 2004. The exposure cited by Paragon is highly remote in practice, and pertains only to ACH transactions between a consumer account and a corporate account – which was NOT the case. In other words, Paragon fabricated a reason citing events that did not occur, predicated on a rationale that was entirely spurious, manifesting an increased exposure to the bank. And Mr. Young’s extensive banking background enabled exposing this obvious FRAUD. Automated Clearing House (ACH) is an electronic network for financial transactions in the United States. ACH processes large volumes of credit and debit transactions in batches. ACH credit transfers include direct deposit payroll and vendor payments. ACH direct debit transfers include consumer payments on insurance premiums, mortgage loans, and other kinds of bills. Debit transfers also include new applications such as the Point-of-Purchase (POP) check conversion pilot program sponsored by NACHA-The Electronic Payments Association. Both the government and the commercial sectors use ACH payments. Businesses are also increasingly using ACH to collect from customers online, rather than accepting credit or debit cards. The Federal Reserve Banks are collectively the nation's largest automated clearinghouse operator and in 2005 processed 60% of commercial interbank ACH transactions. The Electronic Payments Network (EPN), the only private sector ACH Operator in the U.S., processed the remaining 40%. FedACH is the Federal Reserve's centralized application software used to process ACH transactions. EPN and the Reserve Banks rely on each other for the processing of some transactions when either party to the transaction is not their customer. These inter-operator transactions are settled by the Reserve Banks. An ACH transaction starts with a Receiver authorizing an Originator to issue ACH debit or credit to an account. A Receiver is the account holder that grants the authorization. An Originator can be a person or a company (such as the gas company, a local cable company, or one's employer). In accordance with the rules and regulations of ACH, no financial institution may issue an ACH transaction (whether it be debit or credit) towards an account without prior authorization from the Receiver. Depending on the ACH transaction, the Originator must receive written (SEC Codes: ARC, POP, PPD), verbal (TEL), or electronic (WEB) authorization from the Receiver. Written authorization constitutes a signed form giving consent on the amount, date, or even frequency of the transaction. Verbal authorization needs to be either audio recorded or the Originator must send a receipt of the transaction details before or on the transaction date. An electronic authorization must include a customer reading the terms of the agreement and typing or selecting some form of an "I agree" statement. ACH payments have been around for some time now, but people are just getting used to them, especially with the ARC, POP, and RCK SEC Codes, where the original instrument was a physical check. One problem occurs when the account holder issues a stop payment on a physical check not knowing that the check was presented as an ACH entry. Time frame differences can cause loss towards an RDFI when returned ACH entries are subject to the Electronic Funds Transfer Act (Regulation E). An example is for the ARC and POP SEC Codes, where an RDFI has only 60 days from the date of settlement to return an unauthorized debit, and the consumer has 60 days upon notification to dispute a transaction in his statement under Regulation E. The consumer can receive notification via a statement 30 days after settlement. 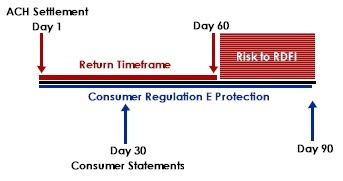 With these time frames, it is possible that the 60-day period allowed for ACH return would expire even before the consumer's 60-day protection (under Regulation E) would expire, leaving the RDFI open to loss. Another problem deals with compliance where the merchant presented with a check issues an ACH entry with SEC Codes ARC or POP. However, the merchant then fails to comply with the handling of the physical check and presents the physical check for payment as well. This causes a double-debit against a consumer account.